The Wurzels & Adge Cutler Gig Archive is very much work in progress - and in some places work would appear to show hardly any progress at all! If anyone is willing to help the mammoth task of filling in the missing dates from the archives - your help would be gratefully received! Any odd dates will help, no information is too small! 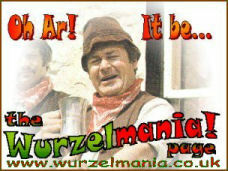 Friday 21st January 2005 (7.30pm) - The Wurzels at Dolman Exhibition Hall, Ashton Gate, Bristol. Advanced ticket prices set at £14.00 for adults and £12.50 for senior citizens and students. Entry is £15.00 on the night for all ages. 12th February 2005 (8pm until 1am) - The Wurzels and 60's and 70's Radio Road Show at Merchant Suite (by the Refectory), Frenchay Campus, University of West England, Bristol. Tickets are £5.00 available from Core24 and all Traders' on the remote sites. Drinks prices are matched to the Student Union's for the entire night (ie Carling at £1.65). 31st March 2005 - The Wurzels and Tony Beard "The Wag from Widdecombe" at Queen's Theatre, Barnstaple "Don't miss these four fantastic zider drinking OAPs as they return to the Queen's Theatre for another night of west country comedy. As well as some of the best scrumpy and weston songs ever written, the Wurzels will be giving their own special treatment to some modern classics." Tickets £10.00. 2nd July 2005 - The Wurzels at CAMRA Plymouth Beer Festival, Plymouth Pavilions, Plymouth. Tickets between £6.00-£3.00. 29th August 2005 - The Wurzels (8pm) and That'll Do (10pm) at The Vintage Inn, Wellington, Somerset. Tickets cost £12.00 plus a free burger from the BQ. Event was in aid of the St Johns' Ambulance. Although the gig was due to start at 8pm, all the fuses blew and by the time the pub had found a back-up generator, the Wurzels took to the stage 90 minutes late - but still put on one hell of a show. Adge Cutler's widow and other family members were in the crowd that night!